“I’ve been meaning to let you know what a wonderful trip we all had! That tour, while non-stop, enabled us to see so much of Italy. The guides we had were incredible! Pompeii was great and we had the best guide who was also an archaeologist–so interesting. Venice was magical, loved Florence, especially Il Latini one of the best restaurants I’ve ever eaten in, Pisa, Siena and Capri–wow! Spent the day in Positano which was breathtaking. The meals that were included in Sorrento and Capri were outstanding. “From Siena, Florence, Rome to Sorrento, everything was wonderful. The hotels were all better than expected, drivers all on time and very friendly and professional, and the tours great. In particular Ismael who took us to see the original David (which took my breath away) was special although all your guides were great. We loved Italy and its friendly people and I tell everyone what a great job you did for us. 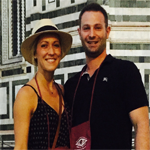 “Jacob and I returned from Italy just a few days ago, and I wanted to tell you that we had an ABSOLUTELY AMAZING time! It was beautiful! Everything was perfect and was so perfectly planned we could not have asked for anything better! We will definitely be recommending you and your company to others and look forward to using you ourselves again (hopefully very soon!!!). “The trip was awesome, everything went so well we had such a great time. 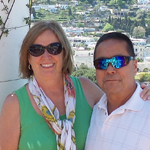 We loved Sorrento and Capri. “Everything was wonderful and beyond and the guide was amazing. It was awesome, the best trip of my life, and I have travel a lot! Also the people that I met in the first part if the tour for 5 days together become like family to me! “Casey and I both wanted to take some time and say thank you for providing us with one of the most amazing experiences we have every had. There are not enough words that can be spoken to show our appreciation for how easy you made this trip for us. Everything was planned out perfectly! From our flight landing in Venice to our final flight landing in St. Louis, the entire trip was flawless. We have already recommended you to several of our friends who are thinking of traveling to Italy in the near future. Our hotel accommodations were incredible. The private drivers that we had were very nice and gave us several fun facts about the areas of Naples and Sorrento/Capri. All of our tours that were planned out were incredible. The tours guides were very knowledgeable about each location and were very eager to ensure that we were getting the most out of the tour. Throughout the trip Casey and I continued to say how we could not believe how easy you made everything for us by setting up all of our trains, hotels, drivers, tours, fights and daily agenda. The trip could not have been more perfectly balanced between guided tours and us just wandering around each city getting lost and stumbling upon magnificent sites. It truly was a once in a lifetime trip that we will now take several more times because of how memorable Italy Now made it for us. 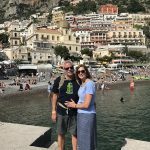 Our trip took us through Venice, Florence, Sorrento, Capri and Rome. Each city was breathtaking with is architecture and culture. Perhaps our favorite part of the trip was simply the food! Every meal we had was outstanding. We tried so many different Italian dishes and cannot recount how many nights we had Gelato (actually it was every night and sometimes during the day as well). “From the night I was picked up from the airport till the end I was sent to the airport, everything went great. Both drivers picked me up and sent me to the airport are very professional and nice. The tour guide Mario, Clara and driver Antonio are great. They are very nice and professional. I felt very safe and comfortable during the whole trip. Shame I couldn’t give the feedback form to Mario but here I would love to appreciate them taking care of us. The toured cities and the arrangement of the timetable is great. It exactly fit into my needs. “The hotels were great; most notably the Park Hotel Villa Carpenada in Belluno and La Canonica di Cortine in Tuscany. Tuscany was incredible and I am trying to bribe a girl friend to go back with me so I can have more time there and do the ‘girl’ things like shopping and wine tours! We also really enjoyed the walking tours in Rome and Venice. The tour guides provided were great; very knowledgeable and personable. “Every facet of the itinerary went smoothly, even the weather was wonderful. We faced each day with positive anticipation as the stunning beauty and interesting points of interest unfurled before our eyes. The flight, transfers, hotels, restaurant recommendations, tours, native Italians and international travelers we met and befriended couldn’t have been better is we had designed this vacation ourselves. Fortune favors the prepared and your thoughtful and professional preparations made our first European travel experience a success. The transition from city to city, as we viewed the stunning beauty of the Italian countryside, was an unexpected delight. I can see why your beautiful country is Europe’s number one tourist destination. The historic points of interest, architecture, priceless art treasures, food, wine, native people, fellow travelers and rustic beauty has elicited in us a love affair with the Italian peninsula. The amount of escorted and free time was just right and the guides were sweet and fluent in many languages. We plan on returning, perhaps another tour or just one or two places which emerged as favorites. (We also plan to study your beautiful, romantic language together). My wife loves Sorrento and Capri (me too, especially the Blue Grotto). My poetic spirit loved Venice. I spent many hours watching the passing traffic on the Grand Canal. I took over 600 photos during our tour, some even in the Sistine Chapel where it’s prohibited (but I swear I was very discreet!). The chapel and the sculpture of David was a dream come true for an art historian like myself. Michaelangelo’s magnificent and monumental masterpieces brought tears to my eyes. One of the best things about our travel experience was the number of fellow travelers we met who exchanged e-mails with us. We even met a lovely Argentinean couple who invited us to their homes. “What an amazing time we had! 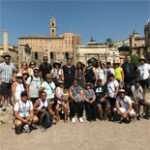 It was wonderful and Italy Now did a great job with picking the hotels – they were clean, nice, and in very good locations. Even the rental car size was perfect! “Our heads are still in the clouds. I am not sure if I can use one word that truly expresses how we feel about our trip to Italy. It was awesome, exciting, expressive, beautiful, excellent, tour-friendly, fun and funny. I can go on and on. We truly enjoyed every moment of it. Pompeii was hot, but historic. 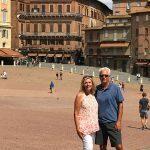 Assisi, Siena and Bologna were intimate yet exciting. Rome was interesting and larger than what we thought. Montepulciano was simply awesome. I really loved our hotel in Venice, it was right on the water. Our gondola ride was simply the best and our “guy” even sang happy birthday to us in Italian and that was just so sweet. 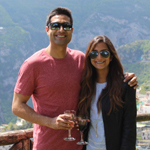 Capri and Sorrento took our breath away. I even told Yvette, our Italy Now guide, to spread my ashes over Capri/Sorrento when I die in 122 years. Our tour guide Stefano was awesome, organized and so much fun to be with. He really enjoys what he does. He was very protective of us and made sure that we are all okay. Our bus tour has 41 people and by the end of the tour we are all friends. We also got the chance to hang out, shop and eat together with our new friends from India, Canada, New Zealand, Brazil, Australia, Singapore, Netherlands, Miami, Tennessee and New York. It seems that people gravitated to us. We took about 1,200 photos and I have attached one from our Venice gondola adventure. Your dream Italian vacation is only a few questions away. Just fill out the form below and we'll help you plan the perfect Italian vacation. We value your privacy and promise to never sell or give out your info. Check to receive email updates on Italy travel and our monthly specials. By clicking "SEND REQUEST", you agree to allow a representative to contact you about your travel plans within 24-48 hours by phone or via email. We would be more than happy to help you. Our team of luxury travel experts are here to assist you. Sign up to receive our Insider Italy Vacation Checklist.